Art di Marrakech is offering wide selection of talelakt services that you will surely love. With our original Moroccan Tadelakt, you will have the benefit of enjoying the fantastic setting of your bathroom, kitchen, or even living room. Certainly, this is a wonderful selection for the surfaces prone to wet environment. The lime plasters works outstanding in wet climates by allowing the water absorbed by the plaster to evaporate quickly tomaintain the good structure of your house. Because of its tolerance in the increasing moisture, this can mean big savings and fabulous look. As the leading provider of the traditional Moroccan plaster Tadelakt in Rome, Italy, Art di Marrakech will confidently provide you the kind of plaster that is incomparable to other providers. The methodology that we are utilizing with our talelakt services has been already proven for several years. People of the ancient centuries already tested the world-class quality of this lime plaster; that is why, we are combining the best technology of the previous era in today’s great technological advancement to promote high degree and trusted lime plaster services. Once you take our services, you will not regret any of your decisions, for the reason that you will not just feel satisfied with the output that we deliver butit can also give you long lasting services. 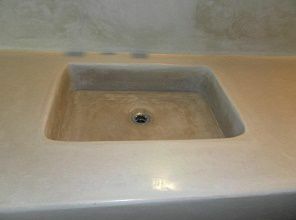 Taking our traditional Moroccan plaster talelakt services can also be a good investment for you. Every time that your guests visit your house, they will be stun by the great appearance of your rooms; making them jealous and wanting to imitate your style. This can also give you wide popularity in your community. Therefore, do not hesitate to contact us. Here at Art di Marrakech, we provide our customers an easy process of reaching us, as they can send us email, call our phone number (In Italy : 00 39 320 484 9811 | In Morocco: 00 212 625 554 920). Once we identified your concerns, you can expect that you will be served immediately. 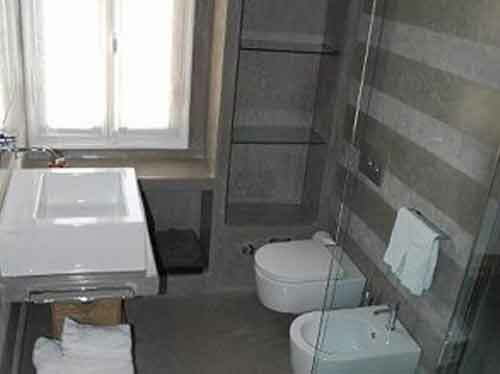 Tadelakt is recommended for bathrooms due to its shine, its iso-thermal and especially its Watertightness, surely you will be amazed when applying this lime plaster coming from Marrakech to your shower or bathroom . Our company will make your room like a luxurious Moroccan Hammam, combined with European touch in respecting quality standardisation. Tadelakt is not only applicable to the bathroom, this magical coating is also suitable for your kitchen, and surely is an alternative of tiles, due to its ecological, fungicidal, bactericidal and its high pH. Feel free to ask us for advices, design ideas, proposal for your kitchen and coating color suitable to your room, we will give you as soon as possible the perfect solutions. 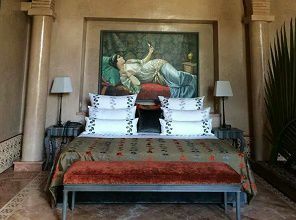 Tadelakt can make your bedroom as a real Riad from Marrakech. 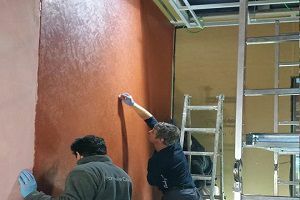 This Moroccan lime plaster is suitable for any surfaces and format, you no longer need a conditioner, your room will be cool in summer and lime in winter, due to its iso-thermal property. We can help to conceive an idea and no doubt you will be surprised what we can do in your room.